The public has a right to know that when they go to a therapist, they are almost certain to be given a psychiatric diagnosis, no matter how mild or normal their problems might be. It is unlikely that they will be told that a diagnosis will be written forever in their chart and that alarming consequences can result solely from having any psychiatric diagnosis. It would be disturbing enough if diagnosis was a thoroughly scientific process, but it is not, and its unscientific nature creates a vacuum into which biases of all kinds can rush. 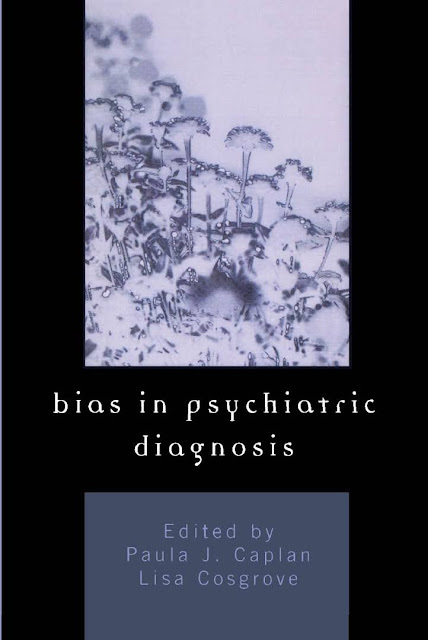 Bias in Psychiatric Diagnosis is the first book ever published about how gender, race, social class, age, physical disability, and sexual orientation affect the classification of human beings into categories of psychiatric diagnosis. It is surprising that this kind of book is not yet on the market, because it is such a hot topic, and the negative consequences of psychiatric diagnosis range from loss of custody of a child to denial of health insurance and employment to removal of one’s right to make decisions about one’s legal affairs. It is an unusually compelling book because of its real-life relevance for millions of people. Virtually everyone these days has been a therapy patient or has a loved one who has been. In addition, psychiatric diagnosis and biases in diagnosis are increasingly crucial portions of, or the main subject of, legal proceedings. This book should sit next to every doctor’s PDR, especially given the skyrocketing use of psychoactive drugs in toddlers, children, and adolescents, as well as in adults, and especially because receiving a psychiatric label vastly increases the chances of being prescribed one or more of these drugs. Purchase through Amazon and support Recovering from Psychiatry!